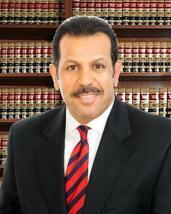 MoreLocated in Phoenix, Arizona, and serving the entire southwest, the Law Offices of Mohammed Alzaidi has 25 years experience in providing personal injury guidance to injury victims, including those in vehicle accidents, pedestrians hit by cars, slip-and-fall accidents and dog bites. Our firm helps families with wrongful death suits, and individuals suffering severe spinal cord injuries and brain injuries. We believe that no justice for the injured means no peace of mind. We do this by exploring...Located in Phoenix, Arizona, and serving the entire southwest, the Law Offices of Mohammed Alzaidi has 25 years experience in providing personal injury guidance to injury victims, including those in vehicle accidents, pedestrians hit by cars, slip-and-fall accidents and dog bites. Our firm helps families with wrongful death suits, and individuals suffering severe spinal cord injuries and brain injuries. We believe that no justice for the injured means no peace of mind. We do this by exploring all options for gaining all the compensation that our clients deserve. While other firms charge 33.3 percent of the settlement in attorney fees, our rate is 25 percent if we do not go to court. Our charges are less, so you get more. We also speak Spanish and Arabic.